Perfetti Van Melle is a private company, engaged in confectionary - gum production and distribution in more than 150 countries worldwide. Perfetti Van Melle is a private company, engaged in confectionary – gum production and distribution more than 150 countries worldwide. The company was established in March 2001 with the merger of two companies: Perfetti S.p.A. and Van Melle NV. The Group strengthened its standing as a third largest confectionary (confectionary + gum) group throughout the world by the purchase of the Spanish Company, Chupa Chups in June 2006 and became the biggest player of the global confectionary market. Currently, it is the third largest group of the world and first confectionary group in leading Asian markets. Perfetti Van Melle is a real global company with its 17.600 employees and 38 companies worldwide. It operates in all markets ranging from the Asia-Pacific region to Europe, Middle East, Africa, North and South America. The Head Office of the Company is located in Amsterdam, Holland. Most of the brands are the products that are known and used prevalently in five continents. Mentos, Frisk, Fruittella, Alpenliebe, Golia, Happydent, Vivident, Big Babol, Airheads, Chupa Chups and Smint. 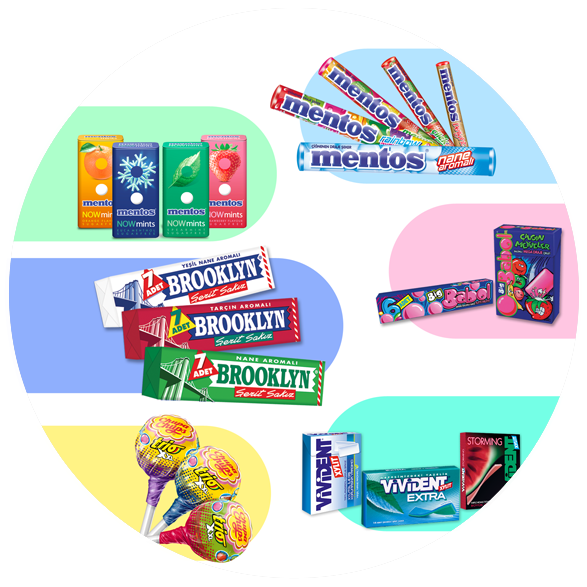 Perfetti Van Melle offers a large series of products, popularity of which is based on individual, local and regional markets, in addition to these global brands. The skill to develop new products or versions and tastes in accordance with different demands and opportunities of local markets is one of the keys of the Group’s success. The innovations of Perfetti Van Melle are the clear proofs of product privatization and its sensitivity to customer demands. Alpenliebe has been a confectionary that has achieved the market leadership in the most of Asian countries through its production with formulae, packaging and formats in compliance with local preferences. Perfetti Van Melle offers a large product range showing wide varieties and having specifications that may be distinguished easily in very developed European markets. Any product similar to the functional gum among these products could not have been produced yet by our leading international competitors. The distribution of the number one brand of the Group, Mentos, is made with a special product range in America and special potential of the market is taken advantage to the highest possible level. World-famous round Chupa Chups lollypops make children and their parents happy exactly in 150 countries in the world with 40 different kinds of tastes and various healthful assortments. Perfetti Van Melle was established in March 2001 through the merger of Perfetti SpA and Van Melle N.V., and these two companies had been working together in various countries since 1979. Subsequently, Perfetty purchased 37 % of the shares of Van Melle in 1991 in the direction of its common interests. This procedure was only the first step of a partnership that would be profitable from the very beginning and fortified gradually until the purchase of all shares of Van Melle by Perfetti. In June 2006, it purchased 100 % shares of Spanish Chupa Chups, a family company that has been very well-known globally with its popular brands of Chupa Chups and Smint. This purchase strengthened its leadership position of the Group in confectionary market and increased the sales potential in mature and developing markets. You can have details in next pages about the backgrounds of three founders of the Group, all of which were family companies: Perfetti, Van Melle and Chupa Chups. Fruittella and Mentos enjoy rapid success being sold in rolls. Like "eating a sweet with a fork": Enric Bernat creates a sweet that delights both children and their parents – the lollipop. The idea of putting a round candy on a stick revolutionises confectionery and gives rise to the brand Chupa Chups. Perfetti decides to start chewing gum production in the mid-fifties, successfully launching the first gum, Brooklyn, that’s entirely made in Italy. The Brooklyn brand continues to enjoy an iconic standing in today’s Italian confectionery market. Enric Bernat opens a small confectionery factory in Barcelona. His family enjoys a long tradition of making sweets, dating back to the mid nineteenth century when his grandfather Joseph started producing them in Barcelona.